Washing your windows takes you a too much time and efforts? You can make a change now – simply call our customer care operatives and request our window cleaning in Earls Court. We will deal with this nuisance for you and the outcome will be appropriate for all parts of your windows – the glass, frames and ledges. With our help, you will have the freedom to do whatever you want with the time you usually spend for window washing. And our services will bring you even more, as you can see from our list of benefits. We also provide our professional services in nearby areas: West Brompton, Kensington, Chelsea, Holland Park, South Kensington. You can count on the cleaners for both private and business window cleaning. All types of glass surfaces are included in our professional practice. For instance, you can get a service for cleaning small or double windows, sash ones, French doors, patio doors and bay windows. In addition to these, we wash and polish garden window surfaces, greenhouses and roof glass. At home or at your workplace, you can always ensure crystal clear glass surfaces – just contact us! We have what it takes and the right methods for the assignment. We provide top-notch window cleaning by using next-generation methods. We deliver gleaming and pristine look for your glass surfaces, roof windows and greenhouses with water-fed extension pole system and jet washing. The poles we use are attached to water reservoirs in our vans, thus eliminating the risk of damage to the exterior of your home or business premise. What's more, we use totally safe rope access techniques to clean glasses on high-rise buildings. You can profit from these techniques now – give us a call on 020 3746 3113! The specialists of commercial window cleaning will provide you with first-class service for your workplace. We can reach up to the fourth floor of your building with our water-fed pole system. If you have windows higher than that, we will perform the job with the help of our rope access equipment, designed specially for hard-to-reach glass panes. All things considered, you can count on us for efficient window cleaning of all business property kinds - from small shops to the towering office buildings in London. 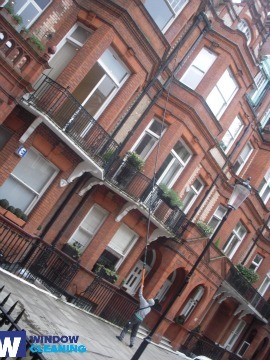 Profit from our swift and dependable domestic window cleaning in Earls Court. We can clean the windows of your house in and outside. The products we use are eco-friendly - you will love the great results and be ecologically responsible. In addition, we use only purified water. Don't delay, call 020 3746 3113 and order our first-rate services. Our customer care staff will take care of you – they are active 24/7. Another ways of booking – our request a cleaner online form or just chat with our operators.